Hmmmf! When did New Orleans get so clean? In the older tower (Mardi Gras) you will find the rooms to be standard-size, and have flat screens and better appointments. The newer tower (Carnival Tower) has smaller rooms. Bathrooms are plain; the tubs and showers are combined. The two bed rooms have two queens, way better than just two doubles. Views can be excellent if you swing a Strip view. The way Harrah's Hotel and Casino Las Vegas is laid out, however, there is a good chance to get a view of the other tower or the air-conditioning vents. 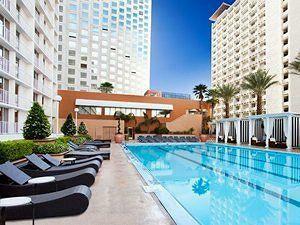 The location, right across from several other major casinos in the center of the Strip, is hard to beat. Good. Harrah's Hotel and Casino Las Vegas sits right over the casino which is right on the Strip, so it's a short walk to other casinos and anywhere else on the property. The staff is pretty friendly. The parking structure in back is somewhat confusing to get in and out of. Check-in waits can be brutal at peak hours, so aim for before 3pm or after 10pm, if possible. Shampoo, conditioner and lotion. It's decent quality stuff. Young to middle-aged. They draw people with a moderate gambling budget who want a well-located hotel. The folks here mostly aren't flashy and they aren't tacky. It's a big rectangle, surrounded by an sundry stand and a bar, where you can get a martini. The pool is not heated and is closed from October to March or April. It's a pretty good deal, so if you're looking for an experience, it won't let you down. You can get a better deal on the Strip, but you can also pay more. Harrah's Hotel and Casino Las Vegas has all the games. The feel is action-packed and exciting in there because so much happens around you. The dealers are more friendly than usual here. 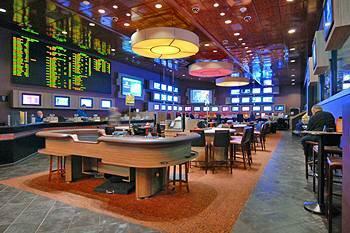 There is also a sports pit that combines lots of televised sports with blackjack and other games. Nothing like multi-tasking your gambling. They usually want $10 minimum in this place for blackjack and craps, but it can be higher on weekends. Roulette has $1 chips with a $10 minimum, and craps runs $10 and higher with 3-4-5x odds. Other games start at $10. From pennies up to at least $100. The Harrah's casino Las Vegas used to have these electronic roulette things that were fun, but they got rid of them (they do have a roulette wheel where you bet electronically, though). Good. The cocktail waitresses wear silly costumes (they all do) and deliver drinks with decent speed. Table players may get food at $25 to $50 play for several hours. A room may be comped to $100 and higher players. Harrah's rewards loyalty. More than any other casino, they comp you well for playing. Harrah's Cafe Las Vegas is open 24 hours a day. For the stragglers, breakfast-seekers, hungry-gamblers, worn-out-dance-queens, and everyone else. They all unite under one roof for the steak and eggs, for the Italian night deal, and for every other thing on the menu here. Well, obviously not everything. But people pop in for something every now and then. 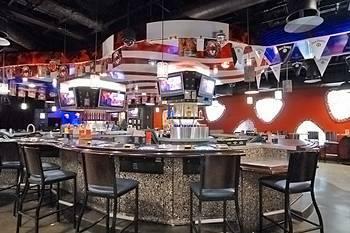 Toby Keith's I Love This Bar & Grill Las Vegas is a fun country style restaurant and bar scene. It's rowdy but not out of hand and gives Vegas visitors an excuse to wear a cowboy hat and boots! There is plenty of entertainment at this country bar with live music every night, a mechanical bull to test out your skills, and beautiful friendly staff, you'll never want to leave. Visit Oyster Bar at Harrah's Las Vegas after a long day of gambling. 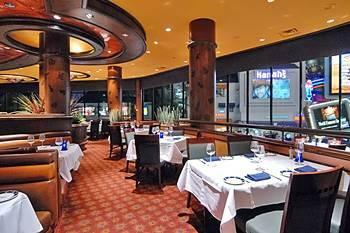 Located right off the Harrah's Casino floor, Oyster Bar Las Vegas serves customers the freshest seafood. Take a seat at their popular 360 degree bar area where you and your party can enjoy staff members prepare their famous chilled oysters. These oysters are deliciously sweet and will melt in your mouth. The Mac King Magic Show Las Vegas has been in Sin City since 2000, which to us is surprisingly long for a family-friendly show, but after you see the show you'll totally get why they keep bringing him back year after year. Get over to Harrah's to see the man himself. Don't leave the kids behind - this is one show that you'll actually be able to afford for them to see. Legends in Concert Las Vegas brings all of the best iconic musicians to one stage. Well, sort of. They are impersonators of the stars but they are REALLY good. 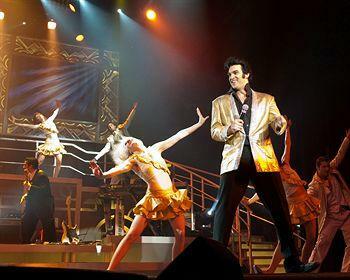 It's as close as you'll get to ever seeing Elvis live so you may as well go for it. The performers are great, music is exciting, and the show has been on the Vegas Strip for 30 years. They must be doing something right. Las Vegas Improv at Harrah's showcase rising stand up comedians who perform in front of that iconic brick wall. Other popular Vegas Comedy Shows features routine performances while The Improv at Harrah's introduces three new comedians weekly. The auditorium will fill up with uncontrollabe laughter that will leave you gasping for air! Apparently Toby Keith is some kind of famous singer, so Vegas decided it needed to pay it's respects to him by making a country bar for all the hillbillies and country girls who come to Vegas still want to shake it a little. Toby Keith's I Love This Bar and Grill Las Vegas plays a little more than country, and mainly all the top hits that even some of the nightclubs play. The Piano Bar at Harrah's Hotel and Casino Las Vegas has dueling piano competitions every night. On top of that though, you can sit and listen to them go, requesting your favorite songs. And yes, they do know how to play "Piano Man." They get the request at least once a night, so don't go overboard. There's nothing they like more than a crowd that doesn't ask for that song. 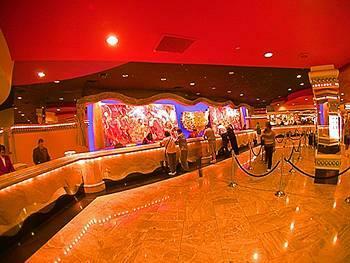 Carnaval Court Bar & Grill at Harrah's Las Vegas has it all. As long as all you want is booze, music and lots of fun. This isn't the sort of nightclub you'd expect to go to when you're in Vegas, actually, this is more of a "get sloshed by 2pm and fall over everyone else on the dance floor without dropping one sip of precious liquor" kind of place. But if you must spill, try doing it in someone's mouth. Yum. There are 42 flat-screens, two of which are big, in the "sports pit" which is a sports and race book, plus has table games and slots. There are about 50 sports seats combined with table games to create something called the "sports pit". To us, it's just sort of annoying and busy. Hey, when we're watching curling we need to concentrate. Eight windows to serve everyone with money, whether you like sports or races or just the thrill of handing money to people on the other side of the counter. No free drinks here, sorry Charlie. A Nathan's Hot Dog cart is in the book, but find some Harrah's Hotel Las Vegas coupon codes for here, or anywhere else in Harrah's Las Vegas. The seats are nice, green leather (maybe vinyl, our fannies aren't sophisticated enough to feel the difference). The layout and lounge seating in the sports bok make it a very social room. There are 12 tables, and more than half are usually running from afternoons on. Pretty dang typical. While the room is pretty nice, the chairs have no wheels or adjustments. 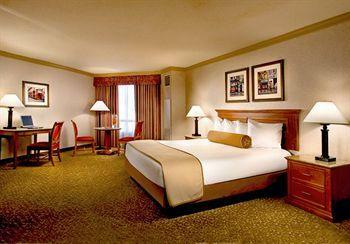 A truly closed room with two doors that let you out to the bathroom or sportsbook. There are windows, though, so don't worry about feeling like you're playing in a closet. Mostly Hold 'Em of the no-limit variety, with limit games at $2-$4 and $3-$6. They have a frequent mixed-games table at $4-$8, but they don't include Dogs On The Table as one of the choices. Nope, but they get a lot of newbies and the dealers will help you catch up. Still, we don't recommend this for a beginner's room. There are 12 tables and usually not much of a wait. They have a computerized wait list, but you'll rarely be on it longer than 20 minutes. Harrah's typical $1 an hour plus points on your Harrah's card to help you gain some fancy status. On weekdays there are lots of tougher older guys who usually don't even pay to the see the flop. On weekends and late at night, the tourists flow in and the games can get ridiculously loose. There are daily low-buy-in tourneys. Lots of TVs on the walls in this joint, all of which show sports. The rake is steep at $5 max, so you'll have a hard time beating that at the limit games. They have some very deep stack tournaments most days. These rooms are pretty standard. You get a king or two queen beds, a bathroom, everything you need to come home after a night out in Sin City. Every TV comes with movies and video games and most rooms come with a minibar as well. All good things in proportion...unless you're in Vegas. That's what we always say. The Luxury rooms are an upgrade from the Classic, but with a view of The Strip that may be worth the upgrade, if a view of Vegas is what you're looking for. 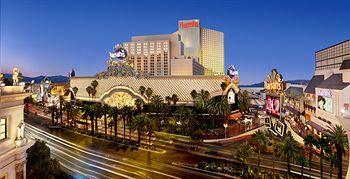 Find some Harrah's Hotel Las Vegas coupon codes before you book your room. Starting at 500 square feet, these suites each come with one king bed. 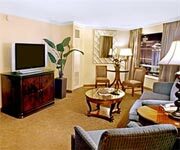 This suite is perfect for a couple on their weekend getaway or special event. 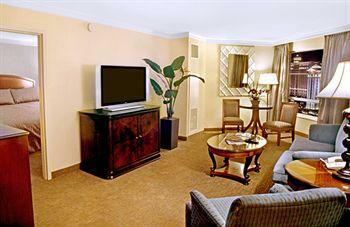 Spread out and enjoy 24-hour room service in the cozy seating area, which includes a table and chairs for 2. There's a minibar in most rooms. Bathrooms have a marble shower/tub combination and granite counter tops, pretty fancy. Starting at 680 square feet, these suites each offer a separate bedroom with one king bed. If you're traveling with a group or entertaining guests, the separate seating area has couches and tables, as well as a full wet bar with a sink and refrigerator. Stock up the minibar and empty it the same night. Then relax in style in the jetted tub, by yourself or with the whole group. Hey, it's up to you! I've stayed at Harrah's both times I've been to Vegas. 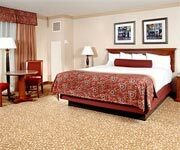 Check-in is easy, and the rooms, while not spacious, are very clean and have comfortable beds. 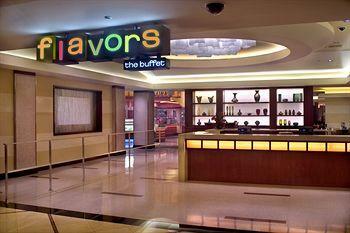 I'm not a huge fan of the casino (just too bland for my tastes), but there are a ton of places to eat. In particular, the buffet is excellent and Toby Keith's bar is pretty cool. The location, as mentioned, is one of the best in Vegas, and you can get to a ton of places by foot in 10 minutes or less. I am taking the time to write this review about Harrah's because I want to make sure this classic and vintage hotel doesn't get overlooked. I took my 23 year old graddaughter and her girlfriend to Vegas for the weekend to see a few shows and to let them experience some of the festive nightlife. 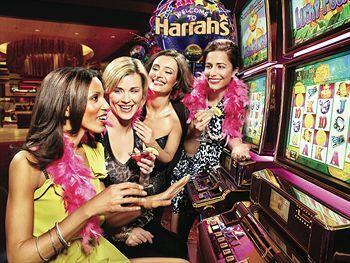 I choose Harrah's to save money that we would then be spending on entertainment and meals. Our first night we were in the mardi gras tower, the room was perfectly fine, no frils, but clean...what i didn't know was that we were above a Very Loud club that went all night long. I am a hip grandma but I do need my sleep. The staff at Harrah's did everything possible to make me more comfortable the next night. they moved us to a room in the other tower and I slept peacefully. Kudos to Harrah's! The room was smaller than I expected and did not have a desk which was pretty important to me being that I was there on business. Other than that, there was nothing much to complain about. The location was good; adjacent to the Venetian which was where my convention was being held. I was thrilled to find a room at Harrah's for half the price that my colleagues were paying at The Venetian. The way I look at it... it is just a place to lay my tired head for a few hours. As long as it is clean and somewhat quiet, I won't complain! In my world, I am a huge believer in "you get what you pay for'. So knowing that Harrah's isn't one of the finer casino/hotel/resort places in Vegas, i wasn't expecting much. The price was so cheap...like $70 bucks. I really have nothing to complain about. The room was a standard room with a TV that worked, was clean, the bed was fine and there was soap and shampoo in the bathroom. When coming to Vegas, I'd rather spend my cash on gambling, food, and drinks rather than the room. I made a good choice. It's a fine value for a place to sleep.